This topic demonstrates how to deny a drop operation over a specific item and specify a visual feedback indicating the operation is not allowed. Please note that in order to disable the drop operation, we've set the DropAction propety to None. This way if we drop an item over a Division element, the RadTreeView will know not to process the operation and will disregard the drop. 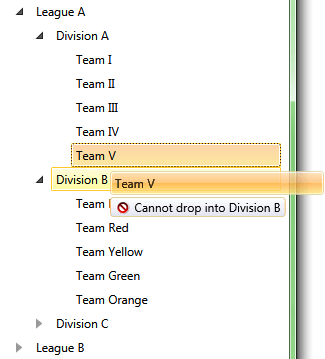 In order to display a DropImpossible indicator in the DragVisual, you need to set the IsDropPossible property to False. In order to change the string describing the drop action, you need to set the DropActionText. dragVisual.DropActionText = "Cannot drop into "
You can download a runnable project of the demonstrated example from our online SDK repository here, after navigating to TreeView/DenyDropVisualFeedback.